My name is Bryan Ritchey, and I am from Boy Scout Troop 984. I am a Life Scout who has been working toward Eagle Scout, the highest honor in the Boy Scouts of America, for almost two years. 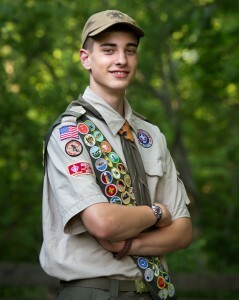 Eagle Scout represents the culmination of the Boy Scouts’ finest achievements. The focus is on service and leadership, with the most important and well-known requirement being to “plan, develop and give leadership to others in a service project helpful to any religious institution, any school or your community.” To put it simply, the Eagle Scout rank provides the opportunity to give back to others. 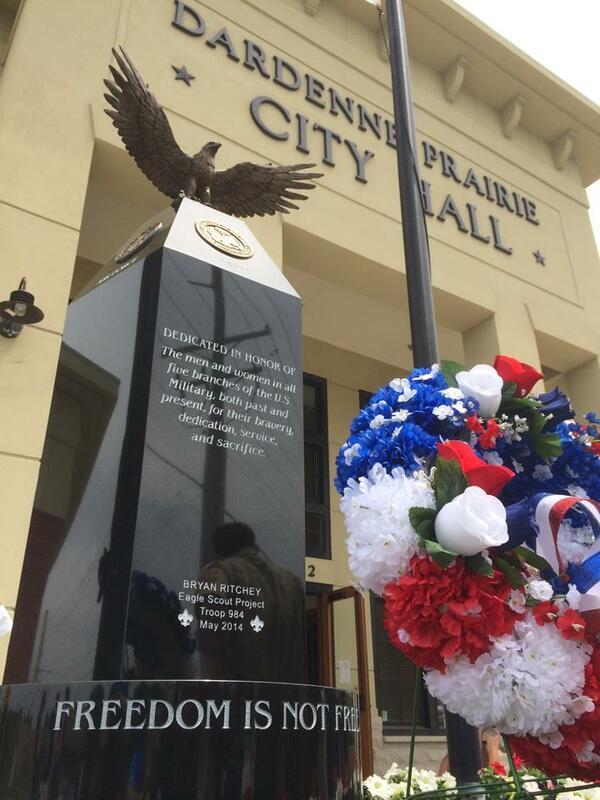 For my Eagle Scout service project, I chose to erect a monument that I designed in front of my hometown’s city hall in Dardenne Prairie, Missouri. It is meant to honor the men and women of all five armed service branches of the U.S. military. When selecting my project, I wanted to pick something that I was passionate about, so I thought back on my past. There has been one thing in my life that stands out more than anything else. For most of my life, our country has been at war. The events of 9/11 and the War on Terror have played a large role in shaping the modern century, as well as our daily lives. When I was younger, my father and I approached men and women in uniform and thanked them for their service. It is now a tradition in my family to thank Servicemembers, no matter where they are—at the airport or a restaurant, or even if we’re just taking a walk. 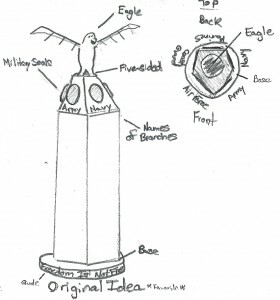 The idea for a monument came to me when I studied sculpture in art class and earned the Boy Scout Sculpture Merit Badge. Both of these factors added the final piece to the puzzle; however, I still had to put it all together. In 2011, when I attended a 9/11 remembrance ceremony in a neighboring town, I thought that my community needed something to honor the members of the military so that we could show our appreciation for what they do. That’s when it all came together. I worked with Dardenne Prairie Mayor Pam Fogarty, the city’s past and present Board of Aldermen, and an exemplary monument company in Seattle called Quiring Monuments. The original price of this project was quoted at about $20,000, but through changes in the design and the generosity of others, the price came down to slightly more than $18,000. A bronze military seal—one for each branch of the military (Army, Navy, Air Force, Marines and Coast Guard)—was placed at the top of each side of the black granite obelisk. The monument is topped by a bronze eagle with its wings spread. Artist and sculptor Cathy Erdmann was commissioned for this beautiful piece. I have met many Veterans of the recent wars in the Middle East, as well as those who served in Vietnam, Korea and World War II. I’ve spoken at Veterans of Foreign Wars halls and American Legion posts and have made the acquaintance of many great people. When I started this journey, my mission was to “honor the men and women of all five branches of the U.S. military, both past and present, for their bravery, dedication, service and the sacrifices.” They make it so that we as Americans can enjoy the freedoms we have today. OUR FREEDOM IS NOT FREE. That is why the first and biggest “thank you” at the monument’s dedication and unveiling ceremony, May 24, 2014, went to all those who have served and are still serving—because who they are, and what they fought and continue to fight for will never be forgotten. Bryan recently finished his freshman year at Barat Academy, where he played on the Boys’ Varsity Soccer and Junior Varsity Golf teams, as well as participated in the Spring Musical. 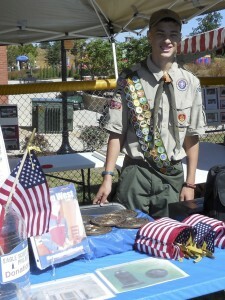 Bryan crossed over into Boy Scouts in 2010. He has held several leadership positions throughout his scouting career. He enjoys earning merit badges and going on troop outings, and is looks forward to experiencing high-adventure camp at the Philmont Scout Ranch in New Mexico later this summer. He would like to thank his friends, family, Troop 984, the Boone Trails Eagle Board (especially those members who approved his project at his first Board of Review), the City of Dardenne Prairie, Lisa Nealey and David Quiring of Quiring Monuments, and Mr. Gene McCallister, a Vietnam Veteran who is his Eagle Mentor and guide along the trail to Eagle Scout. Updates and more information about “Honoring Heroes – Bryan’s Eagle Scout Project” may be found at www.facebook.com/eaglebpr. Thank you to everyone who has commented here. I truly appreciate all the positive feedback that I’ve received. It’s very encouraging. I would especially like to thank all the Veterans for their service. As an Eagle Scout and Navy Veteran I thank you. You should be very proud of your accomplishments. Best of luck in whatever you do. FREEDOM IS NOT FREE!! Thank you so very much! As an Eagle Scout myself and a Army vet, What you did for your project brought me to tears. As others have said, WE NEED MORE PEOPLE LIKE YOU!! You are right, Freedom IS NOT Free. The United States of America needs more thoughtful young people like you ! Congratulations on achieving your goal ! Good Luck and Best Wishes for Success in your future endeavors. Thank you Bryan for honoring all of us who served and are serving. America needs more young men like you. Bryan, your reasoning of why you chose to design a monument, your actual design, together with your caring and sincere heart are exemplary. I know you will continue to do well in life for yourself and for others, that is The American Way. Good luck and Congratulations, Mr Ritchey.